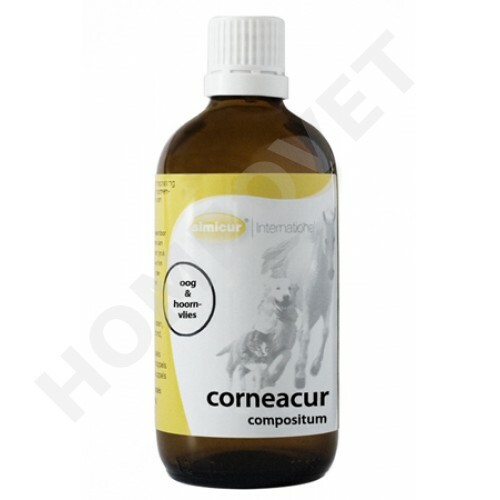 Corneacur is a homeopathic tincture in a 100 ml dropper bottle of SIMICUR for oral use in dogs, cats, horses and ponies. Effects: eye diseases show up often in heavy lacrimation, swollen red eyes and mucous membranes, Blinking and spasmodic closure of the eyelids. If treatment is omitted, the vision can greatly reduce or even disappear. Most common cause of eye diseases in animals is the damage from the outside. As its name suggests, Eyebright is an excellent remedy for different sorts of eye problems. It can tighten the mucous membranes around the eyes, fighting free-radical damage, and can therefore be extremely helpful in cases of infectious and allergic reactions afflicting eyes. Redness and swelling at the edges of the eyelids take off quickly. Ruta graveolens has a stimulating effect on inward weaknesses of the eye and eye strain, while Arnica is used for muscular pain and stiffness, bruises, sprains, trauma and post-operative bruising. Anmerkung: Bei chronischem Augenfluss kann das Auge zur Unterstützung mit 1 Teil Corneacur verdünnt mit 10 Teilen abgekochtem Wasser ausgewaschen werden. inflammation and injury to the cornea keratitis conjunctivits.